Joining a course late can present various challenges for students. As a teacher, you want to do everything you can to help them without letting it interrupt the other students' progress. Buzz can help. When students move from another Buzz course to yours, make sure to transfer their enrollment rather than creating a new one. Get admin help with this: How do I move a student between courses? 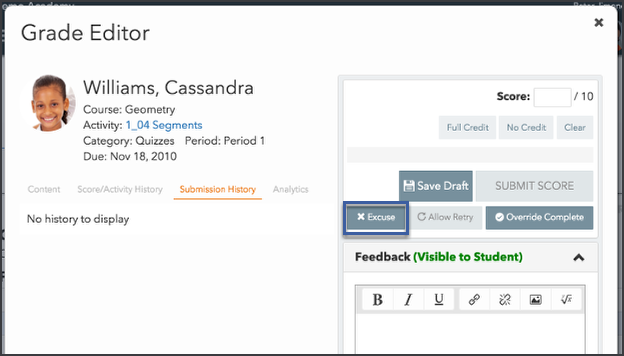 When a student moves between courses that are copied from the same Master Course (even with a Static Copy), submission and grading information remains intact for all activities with matching activity IDs. Having this information in your course can go a long way to assess the student's progress with the content and help them get oriented in the new course. While grades and most submissions transfer seamlessly, posts in Blog, Discussion, Journal, and Wiki activities will not copy over. Once a student is enrolled in your course, Buzz holds them responsible for all activities. The To-do List alerts them that activities are late, the Gradebook may display zeros for those activities, and they may not be able to access some activities if access is dependent on completing assignments they missed by joining late. Open People using the Main Menu. Select each missed activity from the list and click Excuse. Filter the Gradebook by group sets and groups. Create Clipboard support (e.g., messages and tasks) tailored for these groups. Group these students for some activities, so they can help each other catch up; separate them for activities in which they may need the other students' experience. Watch for dips in group performance that might be a result of having missed information. Review Manually create groups to learn how to create a group like this. Although students who enroll late may not be able to make up all the work they miss, they are still accountable for the information and may never catch up without some additional help. Clipboard tasks and activities are a great way to provide this kind of help; they allow you to create group- and individual-specific activities with optional due date and grading configurations to accomodate these students' needs as they try to catch up and keep up at the same time.